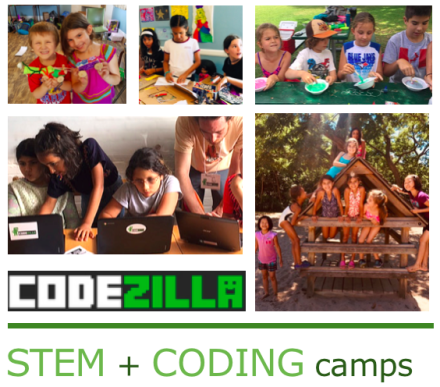 Depending on your child's age and interest, choose from our popular STEM -or- Coding summer camps. Includes plenty of outdoor play, group activities and local field trips. 1) Toy Makers STEM camp (ages 6-10): Assemble, design, paint and program miniature toys, doll accessories and movable robots using cans, clay, 3D printer pens and a toothbrush (yes, a toothbrush!). Kids enjoy a range of hands-on projects that incorporate STEM, crafting and creativity. 2) Game Makers coding camp - Level 2-3 (ages 8-14): take your coding skills to the next level! Create more advanced video games using Scratch. Kids use their creativity and imagination to develop characters, backdrops and games with graphics, sound and animation. Non-violent, gender-friendly games and projects. Codezilla has introduced 1100+ kids in Toronto (K - Gr 8) to early computational thinking and coding using software, apps and educational tech toys. Our programs are enjoyed in 20+ schools and daycares, camps, weekend workshops and birthday parties across Toronto.